Growing plants from seed is advantageous for many reasons! It allows you to get a head start indoors before transplanting outside. It is also more economical, giving you the best bang for your buck, and can encourage you to sow heirloom and harder to find varieties of your favorite plants! With that said, where do we begin? When starting your seeds, a little planning can go a long way. Almost any seed can be started indoors for a head start on the season. Typically, people will start their long-term growing veggies inside such as brussel sprouts, cabbage, cauliflower, eggplant, okra, tomatoes, broccoli and kale. Some plants do not transplant well and need to be direct sown such as peas, beans, melons, radish, squash, carrots and corn. Always try to get the most up to date seeds as possible for best germination. If you can’t find any current seed, then a good rule of thumb is most seeds lose 5% of their germination rate listed on the packet per year. Consider how much room you have inside the house that you can dedicate to get your transplants started. Estimate how much room you have outside in the garden beds to have an idea of how many transplants you will need. Sketch out the area you are planting in to visualize your beds. Once you have those numbers in mind, you can purchase your seeds. It is always a good idea to add a few extras to compensate for seed mortality. The seed packets will also have guidelines you should note when planning your garden, these are only a guideline however so be sure to consider your planting zone, light conditions and environmental conditions such as moisture and run off. The right tools and supplies are very important with successful seed starting. Just like us, plants need the right balance of nutrients and condition to grow healthy with less risk of disease or pest infestation. In the early phases a good blended soil/potting mix is crucial to supply the young plants with the right nutrients. There are bagged starter mixes, or you can blend you own with a good compost. If you are using your own compost, make sure there are no grass clipping that have been sprayed with an herbicide in the compost pile. For a starter mix only blend about 20%-35% compost to soil. Finally, you will need a container to hold your seedlings. The container can vary quite a bit as there are several bought options, or you can be creative & upcycle a yogurt container. Whatever container you use be sure it has adequate drainage or add some holes at the bottom. The container needs to hold up through the starting phase, repeated watering can breakdown a paper material. A peat or coco fiber cup are best as they will breakdown naturally. Fertilizer: ½ Power of recommended dose (only after 2nd set of leaves have fully formed) twice a week till transplant. Not necessary if using a composted soil. Some seeds you can throw on the surface of the soil and they will take care of themselves. Most vegetable seeds however need to be set at a certain depth for the best results. Your specific depth is indicated on your seed packet and some will show the plant spacing and row spacing. If you do not find the planting depth information, a good rule of thumb is plant twice the diameter of the seed. 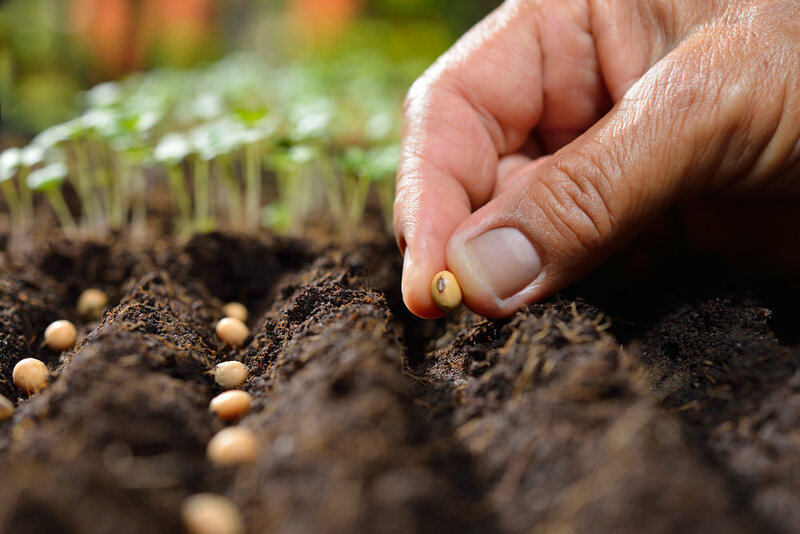 Lightly pack the soil around the seed, packing soil too tightly can cause poor root development. Lightly water the new seeds, avoid blasting the soil with a strong water flow and unearthing the new planting. This is a good time to label your seedlings as well.